Leinster will go into next weekend's Champions Cup semi-final without a win in their last two games as Glasgow Warriors overturned the champions in their own back-yard to take control of Conference A ahead of Munster. With an hour of this topsy-turvy contest gone, it looked as though things couldn't have gone much better for Leinster. 24-18 in front, Leo Cullen had seen his side show great character to mount a comeback against a strong Glasgow outfit, while he also saw Robbie Henshaw and Devin Toner make big impressions on their returns from respective injuries. Then he lost Tadhg Furlong to a knee injury. The tighthead came on at half-time and after initially going down clutching his knee in agony, he was thankfully able to walk from the pitch. Leinster now face an anxious wait to determine the extent of the damage. 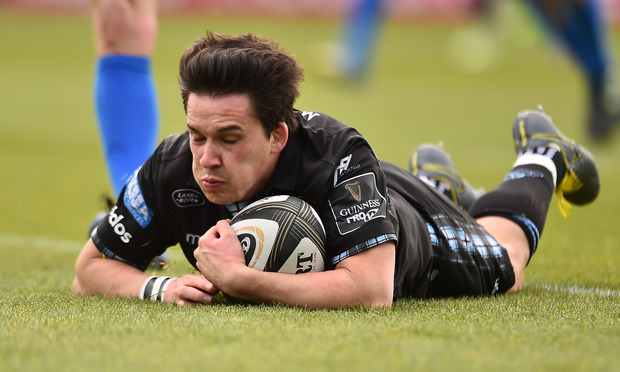 Glasgow outscored Leinster by five tries to four as they edged a cracking spectacle against a home side whose home semi-final had long been secured before today. Rob Kearney ended his 53-game wait for a try for club or country as he crossed for a brace with his brother Dave repeating the trick with two tries of his own. It was a good afternoon for Rob Kearney, who was assured in most aspects of his play. He would appear to be in pole position to regain his spot in Leinster's Champions Cup team to face Toulouse in next Sunday's semi-final. Henshaw looked sharp on his return as he carried powerfully for the 59 minutes he was on the pitch, showing no ill effects of the troublesome dead leg that has kept him out. The centre's return is a major boost ahead of the visit of Toulouse, as is having Toner back running the lineout. Having largely been injury free during his career, this is new ground for the towering lock, but like Henshaw, Toner impressed on his comeback and got through a mountain of work. With Leinster trailing 18-12 at half-time, Leo Cullen wasted little time in strengthening his side as he introduced Sean Cronin, Furlong and Cian Healy, who made a particularly big impact. A 4th minute yellow card for Ross Byrne after he tackled Seymour without the ball left Leinster chasing their tail early on as Hastings put Glasgow on the board with the resulting penalty. Despite their numerical disadvantage, Leinster gained a foothold in the game and when they won a kickable penalty of their own, they opted to go for the corner with their goal-kicker in the sin bin. It proved to be a wise decision as after winning the lineout, Jamison Gibson-Park bided his time before firing a superb pass out wide for Dave Kearney, who stepped inside Stuart Hogg to score after 10 minutes. Joe Tomane was off target with the conversion and just before Byrne returned to the fray, Hastings added a second penalty for a 6-5 lead. With Leinster restored to their full compliment, it was the visitors who struck for a brilliant try. Ali Price made a sniping break and then played a sumptuous offload for the onrushing Sam Johnson, who still had work to do as he shrugged off Byrne to score. Hastings added the extras as Glasgow opened up a 13-5 lead as the clock ticked by the quarter hour mark. Leinster never panicked however, and were rewarded for a period of sustained pressure four minutes before the break when Rob Kearney strolled through a gaping hole in the defence. Byrne's conversion brought his side back to within a point, but Cullen will have been fuming that they allowed Glasgow in for a late first half try when Hastings floated a stunning pass for Seymour to finish in the corner. Hastings couldn't add the extras this time, but nevertheless, the Scots took an 18-12 lead into the break. With the Ireland front-row trio introduced, Leinster looked like a different team as their intensity levels were cranked up with Healy's powerful ball carrying. The loosehead was central to to Rob Kearney getting over for his second try of the game as he punctured holes in the Glasgow defence before the ball made its way wide for the full-back to score. Byrne bisected the posts with a touchline conversion as Leinster retook the lead (19-18) for the first time since the ninth minute. Jordan Larmour had shown glimpses of his dazzling footwork and when he got the ball in half a yard of space, he didn't disappoint. He bamboozled the Glasgow defence and then found Rob Kearney, who unselfishly fed his younger brother Dave who crashed over to complete a brace of his own just after the hour. Leading 24-18, the tide slowly started to change. Furlong was forced off injured and barely a minute later, Matt Fagerson hauled Glasgow back into it, with Hastings' conversion pushing the visitors back in front. Now it was Glasgow's turn to turn up the heat and Leinster couldn't handle it as Zander Fagerson burrowed his way over from close range to secure the bonus point. Hastings added the extra two for a 32-24 advantage. Glasgow rubbed salt into the wounds with a fifth try late on through George Horne, which Hastings again converted. By that stage however, Leinster's had already turned their attention to Toulouse next Sunday. Leinster – R Kearney (A Byrne 62); J Larmour, J Tomane, R Henshaw (C Frawley 59), D Kearney; R Byrne, J Gibson-Park (H O'Sullivan 64); E Byrne (C Healy h/t), J Tracy (S Cronin h/t), M Bent (T Furlong h/t-64); D Toner, J Dunne (W Connors 74); J Murphy, S O'Brien (capt) (M Deegan 59), C Doris. Glasgow Warriors – S Hogg; T Seymour, K Steyn, S Johnson (P Horne 20), N Matawalu (H Jones 66); A Hastings, A Price (G Horne 66); J Bhatti (A Allan 62), F Brown (G Stewart 75), S Cummings; J Gray; R Harley, C Fusaro (capt) (A Ashe 2) (B Flockhart 62), M Fagerson. Cian Tracey There's nothing like a first home defeat of the season to sharpen the focus ahead of the biggest game of the year. Brendan Fanning Same part of the world but an altogether different atmosphere. Brendan Fanning Not your average game of rugby this. And one referee Mike Adamson will remember for a while. After the party comes the hangover.